With excitement and anticipation, the Le Club 18 and Under Intermediate Junior Tennis Team is competing in Mobile, Alabama, October 31-November 2 for the USTA Junior Team Tennis National Championships! The Le Club Racquet and Fitness Club team qualified for the National Championship when they won the Wisconsin District Championship in July and proceeded to win the USTA Midwest Section Championship in August. Members of the Le Club Team are Lucy C. Bartlett, Michael Hinman Camilleri, Evan M. Giesemann, Trevor J. Katzban, Saira Khanna, Holden Sherer and Karli A. Wettenberg. 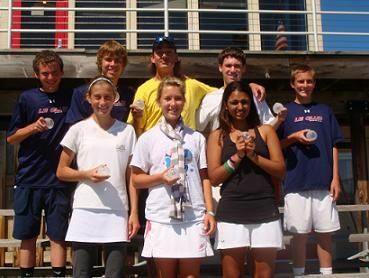 The team is coached by Chip Liefert, Tennis Professional and Director of Junior Tennis at Le Club Sports Club. The Wisconsin District congratulates the hard work, dedication, friendship and fun that brought the Le Club team such success! Best of luck to the team as they compete throughout the weekend.